During functional activities such speaking and eating, the jaws contract and relax rhythmically, and reflexes help protect the teeth from damage. Bruxism transforms that action into a reflex or an unconscious behavior, forcing the jaw muscles into prolonged tension without the limiting factor of protective reflexes. As many as half of all tooth grinders show a family history of bruxism. Between 15% and 30% of children demonstrate bruxism, but most outgrow the condition during the rapid changes that characterize developing mouths. Only about 8% of the adult population grinds its teeth in sleep. Sleep bruxism affects males and females equally, and tends to accompany transitions among varying levels of brain activity. The condition can cause facial pain, a dull but lingering headache, or a tight, sore jaw that’s evident on waking. Diagnosis of sleep bruxism typically begins when a spouse or partner mentions hearing the activity and a dentist diagnoses it from the condition of the mouth. Bruxism yields about 250 lbs. per square inch of force, equivalent to pressing a walnut in a nutcracker. It can alter facial appearance, damage the jaws, and dramatically shorten the teeth, leaving them sensitive to hot, cold, and sweet stimuli. Dental enamel normally wears down by about 0.3 millimeters every decade, but patients with continued bruxism can display 2 millimeters of erosion by early adulthood. Bruxism can chip, crack, break, or loosen teeth and dental restorations, leading to tooth loss. Correcting these effects can require fixed or removable restorations, including root canals, crowns, implants, or even dentures. Bruxism also causes receding gums, insomnia, and ear pain. One way to stop bruxism is to interrupt it. A professionally fitted splint, bite plate, or mouth guard prevents clenching, absorbs the pressure of tooth grinding, or holds the jaws in position during sleep. Over-the-counter mouth guards may be unable to compensate for misaligned teeth, and may stimulate the bruxing action in the first place. Their soft materials erode under pressure. 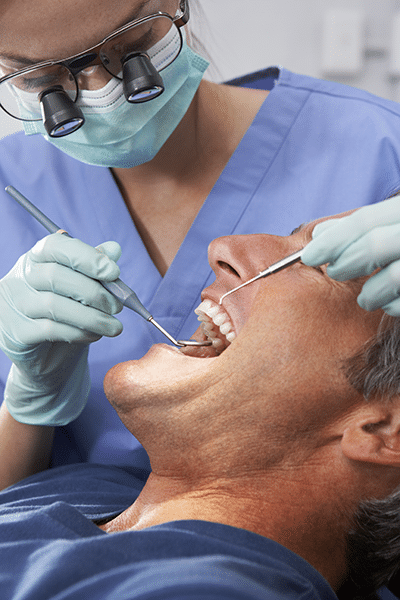 The most-effective oral guards begin with dental impressions taken in a dentist’s office. Some oral appliances also treat airway obstructions that cause sleep disturbances and bruxism. Stress reduction lowers tensions that may cause sleep bruxism. Counseling, exercise, biofeedback treatment, physical therapy, or prescription medication may alleviate stress enough to stop the condition. Promoting relaxation at bedtime through hot baths, yoga, soft music, or warm compresses placed against the hinge of the jaw also reduces stress. Changing sleep positions may repattern sleep. Awareness of the problem begins the process of curbing daytime bruxism, which affects more women than men. To reduce clenching, patients learn to place the tongue tip between the front teeth, pulling the jaws apart. If misaligned teeth prompt the condition, orthodontia removes the cause. Bruxism triggers include non-food chewing, along with caffeine, alcohol, and intensely crunchy or chewy foods (for example, nuts, hard candy, and steak). Patients should remove trigger foods from their diets, avoid chewing gum, and break the habit of chewing on pencils, cuticles, or fingernails.